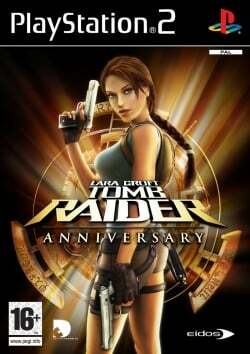 Game description: Inspired by the first Tomb Raider videogame, originally released in 1996, Lara Croft Tomb Raider: Anniversary is a totally new 2006 adventure for Lara, faithfully preserving the elements which made the original Tomb Raider such a classic. Using an enhanced "Tomb Raider Legend" game engine, the graphics, technology and physics bring Lara's adventure and pursuit of a mystical artefact known only as the Scion up to today's technology standards and offer gamers a completely new gameplay experience. The puzzles are now more in depth and incorporate environmental interaction and physics driven solutions. The level design and flow of gameplay are inspired by the original videogame making Lara Croft Tomb Raider: Anniversary a brand new experience in gaming, while still invoking the nostalgia of the first adventure in Tomb Raiding. It is a remake of the first video game in the series, the original 1996 Tomb Raider. It uses an improved version of the Legend game engine (from Tomb Raider Legend), and it includes all of the original environments from Tomb Raider. The PAL version of this game gains a big speedup by (in combination) setting "EE Cycle Skipping" to 2 under Config > Emulation Settings > Speedhacks, and activating "Monitor Frequency PAL-60" under Options > Display in the game-menu.